TORONTO (Jan. 15) — As the largest individual shareholder at Maple Leaf Sports and Entertainment, it is incumbent upon Larry Tanenbaum to bar the entrance of Scotiabank Arena on all future game nights. Send fans away. Issue full ticket–refunds. Instruct equipment staff to mothball the blue uniforms of the home team. Confiscate all passports while in the United States. Do anything that will prevent the Toronto Maple Leafs from further embarrassment on Bay Street and maybe — just maybe — preserve those Stanley Cup predictions from last summer. Right now, the Leafs couldn’t win the Memorial Cup with their putrid display on home ice. With a 13–10–1 record after 24 games, the club is on pace to finish the 2018–19 schedule at something like 23–16–2 at Scotiabank Arena. Or seven games above .500. For the record, no team in the 102–season history of the National Hockey League has won the Stanley Cup with more than 14 defeats at home (the Los Angeles Kings were 23–14–4 at Staples Center in 2011–12; then 22–14–5 in 2013–14). Last year’s winner, Washington, was 28–11–2 at Capital One Arena. The Leafs can equal that loss–column mark as early as Sunday night against Arizona. Or, next Wednesday… against the defending champs. 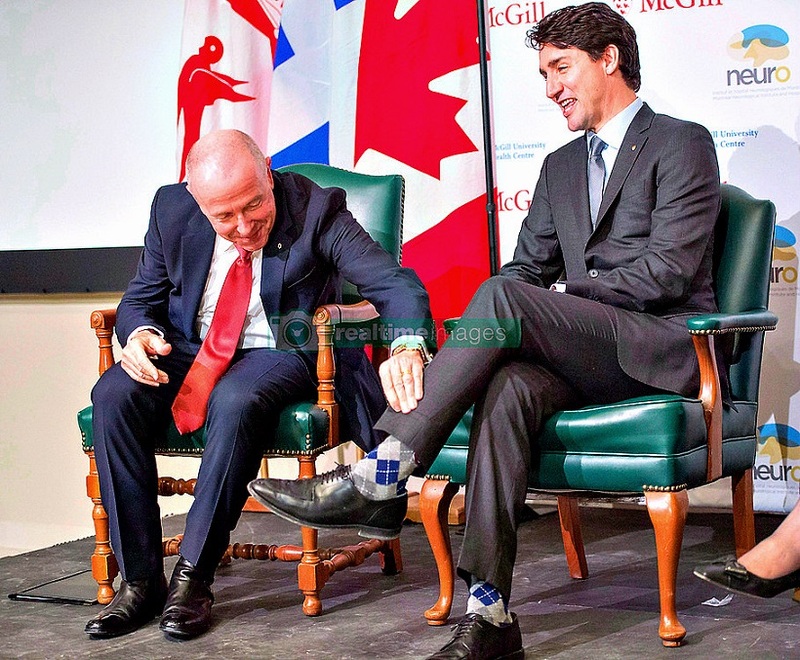 LEAFS CHAIRMAN LARRY TANENBAUM (LEFT) — CLOWNING, HERE, WITH CANADIAN PRIME MINISTER JUSTIN TRUDEAU — CANNOT POSSIBLY APPROVE OF THE CLUB’S PERFORMANCE ON HOME ICE. 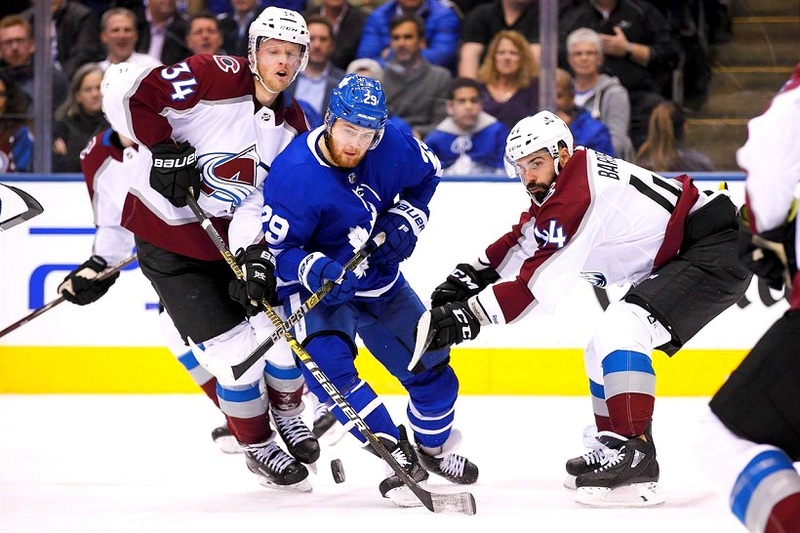 The vaunted Maple Leafs — with all their offensive firepower — are 1–5 in their past six home dates; the latest humiliation, a 6–3 loss to Colorado on Monday night (the final count inflated by two empty–net goals). The same Colorado team that got blanked at Montreal on Saturday and came here in the midst of a 3–10–3 tailspin. In other words, a bit different than dropping a home game to the Boston Bruins, as did the Leafs two nights earlier. Excuses are aplenty: Frederik Andersen just returned from a lengthy groin injury… William Nylander isn’t yet in playing–shape (sigh)… Auston Matthews is slumping badly (one goal in his past nine games)… the shooters are missing wide–open nets. At some point, however, the leadership of the hockey club will come squarely into focus. To wit: Why can’t the highest–paid coach in NHL history squeeze more out of his talented roster before 19,000–plus each night? And, how long will the rookie general manager sit back and watch the Jake Gardiner–Nikita Zaitsev and Travis Dermott–Igor Ozhiganov defense pairings; neither of which can possibly weather four Stanley Cup rounds? Questions, right now, without answers. There is, of course, plenty of time to right the ship. If the Leafs can wake up and win, say, 13 of their final 17 home dates, the angst will diminish; the club will serve notice that Scotiabank Arena is not actually a free pass for the opposition. But, evidence is scanty. And, the malaise on home ice is offsetting the Leafs’ very–good work on the road (15–5–1, tied with league–leading Tampa Bay for fewest losses). The longest remaining home–stand is a four–gamer: Washington, Montreal, Buffalo and Edmonton from Feb. 21–27. The Maple Leafs will finish their schedule with 11 of their final 16 (and seven of their last 11) on foreign ice… which shouldn’t be nearly the comfort it appears to be at the moment. Until the club begins to enervate visitors to Scotiabank Arena, it is virtually–certain to continue the longest current championship drought. AMALIE REDUX… Thursday night’s game at Tampa Bay should be rather intriguing — not because the Leafs have any reasonable hope of catching the Lightning for first place in the Atlantic Division (T–Bay leads by 14 points), but as a result of Toronto turning in its most–dynamic performance of the season in its previous visit to Amalie Arena. That occurred on Dec. 13 and ended in a massively–deceiving 4–1 triumph for the home team. The Leafs, that night, skated circles around the Lightning and amassed a shot–advantage of 48–21. Only the miraculous work of Andrei Vasilevskiy in goal for Tampa Bay prevented a landslide–win by the visitors. At 2–5 in their past seven matches, the Leafs are in need of a picker–upper in their consecutive–nights journey (Thursday/Friday) to Tampa and Sunrise. Perhaps some natural Vitamin–D will do the trick. DON’T GET WILD… The recent slump has positioned the Blue and White somewhat precariously in the Eastern Conference. Consider that if Montreal wins at home tonight against Florida, the Canadiens — occupying the first Wild Card playoff spot — will move just one point in back of Toronto (57–58; Leafs with three games–in–hand). Prior to the season, the notion of the Leafs qualifying as a Wild Card team (finishing fourth in the Atlantic) was nonsensical. Perhaps it still is. But, Babcock’s boys need to pick it up. In a hurry. 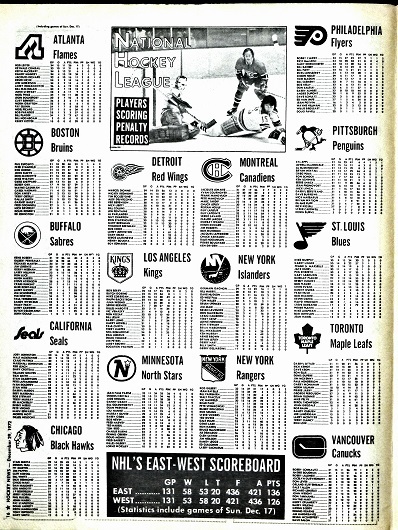 From the Dec. 29, 1972 issue: The NHL, in 1972–73, was a 16–team circuit — the Atlanta (now Calgary) Flames and New York Islanders joining as expansion clubs. 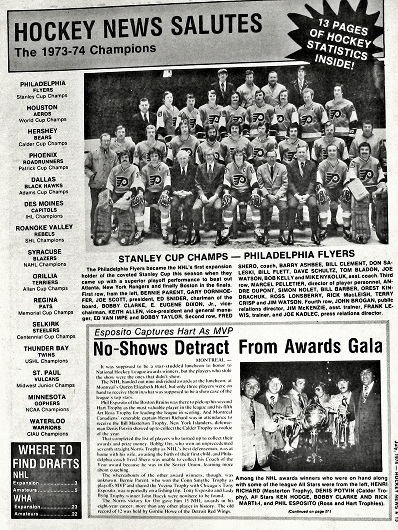 Still part of the NHL (top–right) was the California Seals. In the early–70’s, NBC televised a Game–of–the–Week (below), normally on Sunday afternoon and picking up steam after the National Football League season. Super Bowl VII (in which Miami defeated Washington to become — and remain — the only club to go undefeated through an entire NFL season; 17–0, including playoffs) took place at the Los Angeles Coliseum on Jan. 14, 1973. 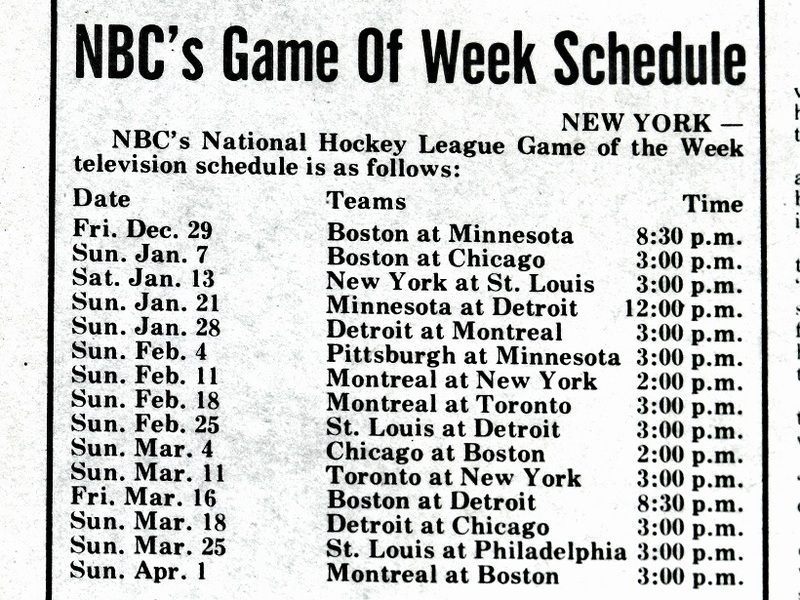 So as to not coincide with the match, NBC carried the New York Rangers at St. Louis the previous afternoon (Jan. 13). 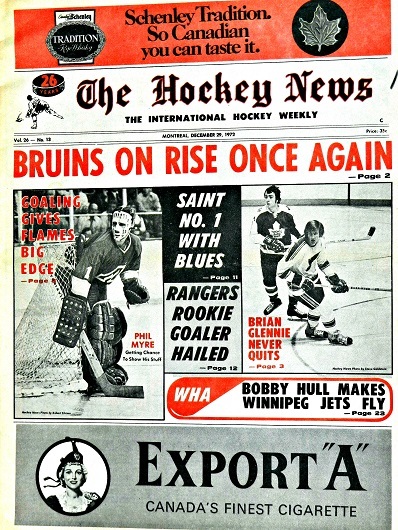 The eventual–champion Montreal Canadiens appeared four times on the NBC hockey package. 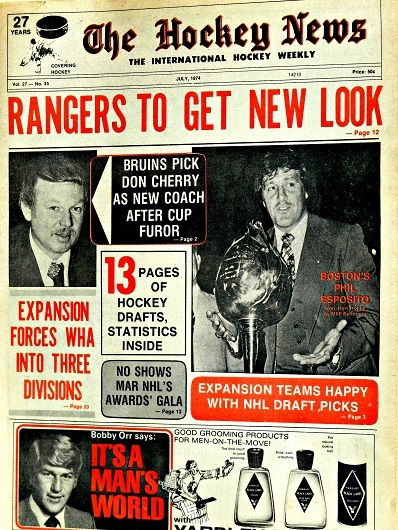 From the July 1974 issue: On the cover, Don Cherry was announced as coach of the Boston Bruins, replacing Bep Guidolin. On the inside were some incredible statistics. 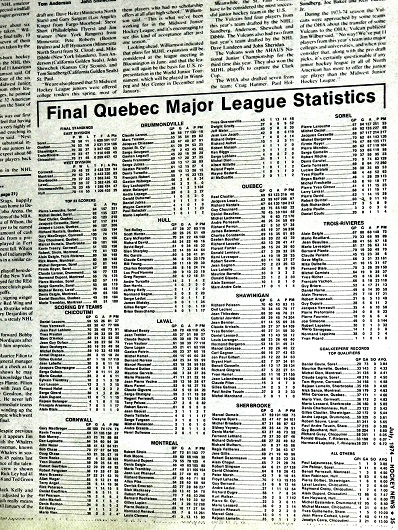 The Quebec Major Junior Hockey League, at the time, was considered the weakest of the three Junior circuits in Canada (Ontario and Western included) for its lack of defense and goaltending. 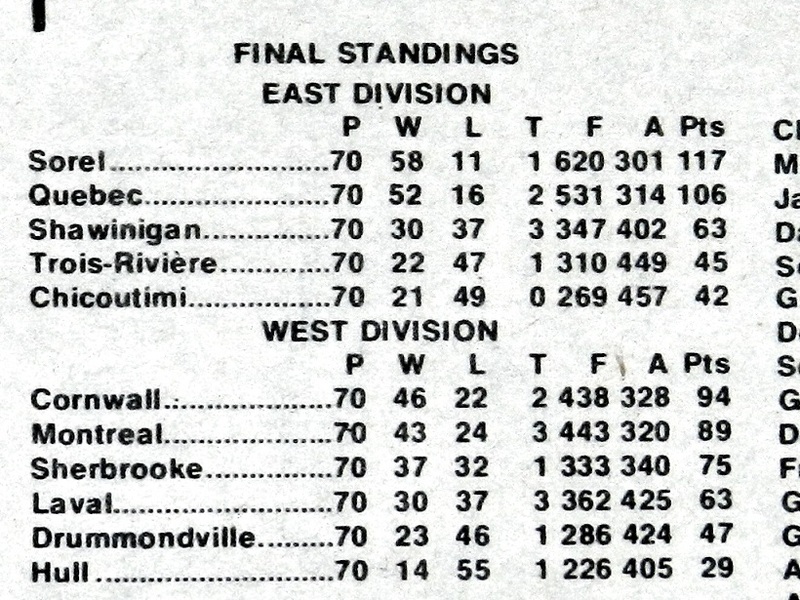 In 1973–74, the Sorel Black Hawks (as evidenced, below) topped the QMJHL with 58 wins; 117 points… and a stunning 620 goals scored (nearly 8.86 per match). 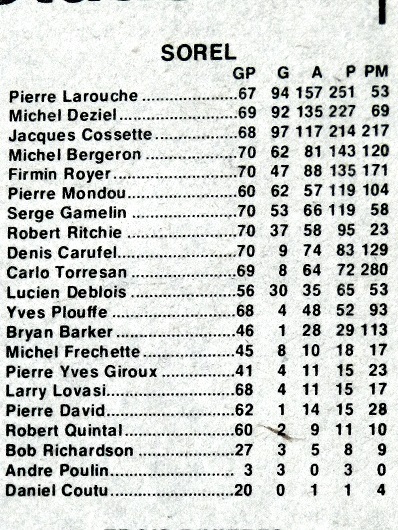 All of the Top 25 scorers in the ‘Q’ that season (top–left) recorded 100–or–more points. Pierre Larouche (to be drafted eighth by Pittsburgh in 1974) led the league with 251 points. His record was beaten by another future Penguin, Mario Lemieux, who compiled 282 points (in 70 games, 4.01 per match) with Laval in 1983–84. But, the 157 assists by Larouche in ’73–74 is still a league mark. 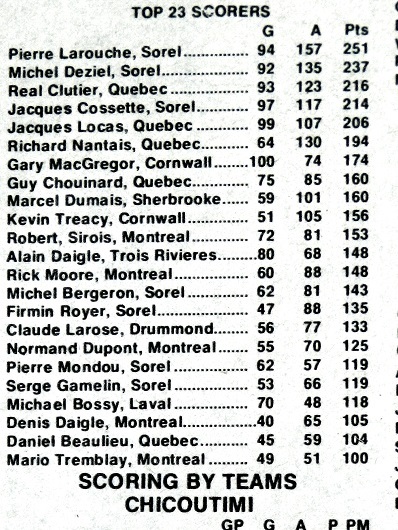 Three of the six highest individual–point accumulations in QMJHL history were authored by Sorel players that season (Larouche, Michel Deziel and Jacques Cossette). Only Larouche went on to distinguish himself in the NHL — scoring 395 goals over 14 seasons with Pittsburgh, Montreal, Hartford and the Rangers. His career best was 53 with the Penguins in 1975–76. Deziel played one game with Buffalo in 1974–75. Cossette appeared in 64 games with the Penguins over three seasons (1975–76, 1977–78 and 1978–79), scoring eight goals. 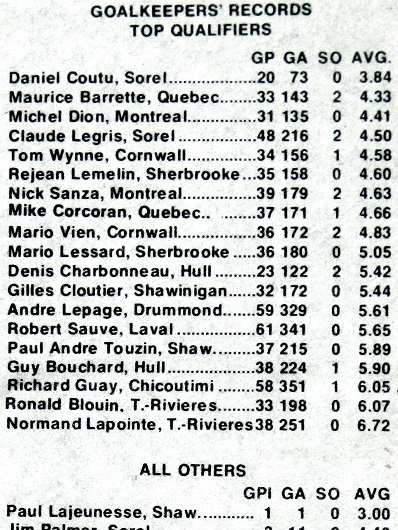 As you’d imagine, Quebec League goalies did not exactly shine throughout the 1973–74 season (stats, top–left). Of the group, Michel Dion, Rejean Lemelin, Mario Lessard, and Bob Sauve went on to play multiple seasons in the NHL — Lemelin leading with 507 regular–season games for Atlanta/Calgary and Boston between 1978–79 and 1992–93. 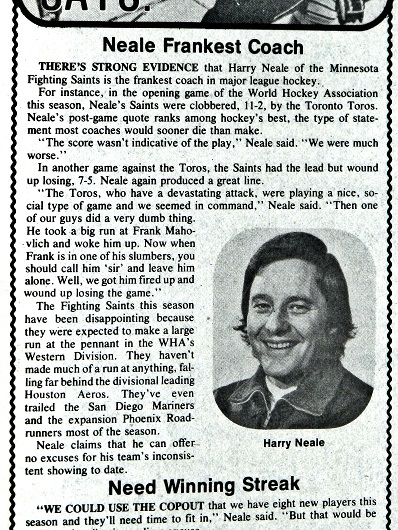 From the Jan. 10, 1975 issue: While coaching Minnesota of the World Hockey Association, Harry Neale (then 38) provided evidence (top–right) as to why he’d become the lead analyst on Hockey Night In Canada for two decades, calling the Stanley Cup final alongside Bob Cole for 21 seasons (1985–86 to 2005–06). 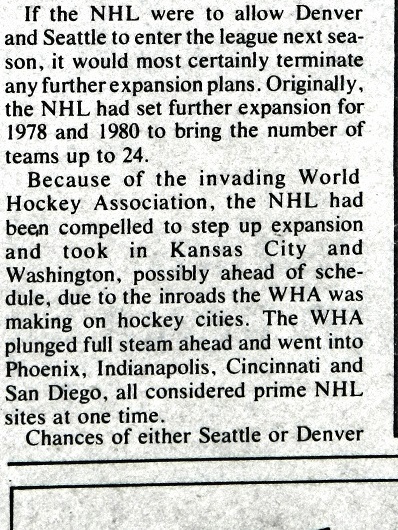 From the Feb. 7, 1975 issue: A wildly–inaccurate, as it turned out, forecast of the NHL’s expansion plans (above and below). 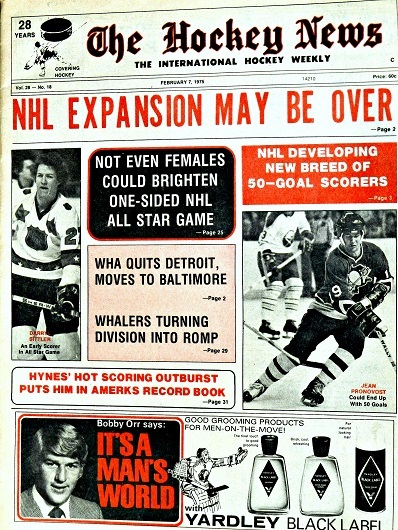 Denver and Seattle were expected to join the league for the 1976–77 season (not ’66–67, as mistakenly printed). 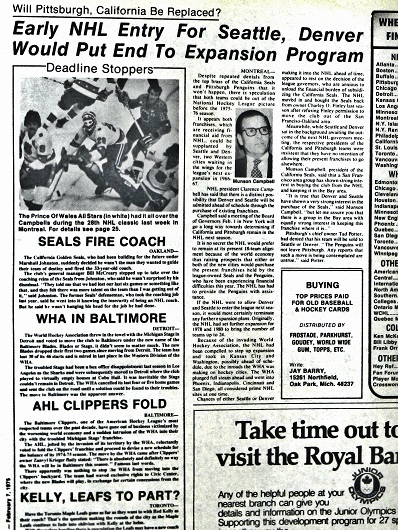 Instead, the Kansas City Scouts moved to Denver (as the Colorado Rockies) and the California Seals re–located in Richfield, Ohio as the Cleveland Barons. 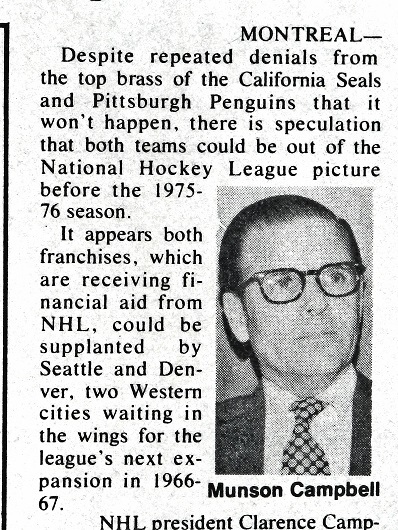 Seattle never came to fruition, as funding efforts by owner Vince Abbey (of the Western Hockey League Totems) failed. The city in Washington State was finally awarded an expansion franchise by the NHL on Dec. 4, 2018… to begin play in 2021–22. 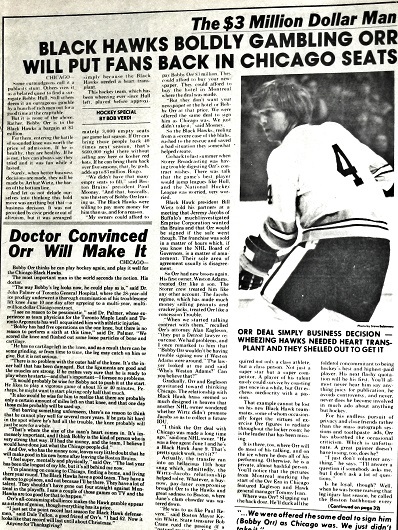 From the July 1976 issue: After 10 injury–impeded but brilliant seasons with the Boston Bruins — and though unrestricted free agency was not–yet part of the NHL — Bobby Orr somehow left the Boston Bruins and signed with Chicago for 1976–77. The Black Hawks were hopeful that Orr might overcome his chronic knee issues and inflate lagging attendance at old Chicago Stadium. 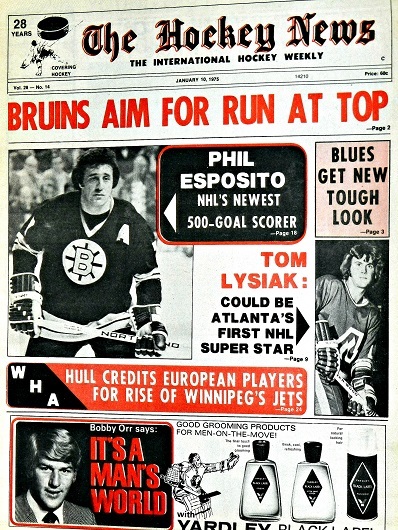 Alas, hockey’s greatest all–time player could not prolong his career in the Windy City. He dressed for only 26 games with Chicago; sat out the entire 1977–78 schedule and tearfully announced his retirement on Nov. 8, 1978. Of massive coincidence was that Orr’s final NHL goal, and point, occurred at the old Detroit Olympia on Oct. 28, 1978 — the same venue in which he’d made his debut and recorded his first NHL point, with Boston (Oct. 19, 1966). One issue I find the media is not concentrating on is Babcock’s failures as a coach. He is getting a free-pass right now. Want to know my theory for home ice struggles: Line-matching! Babcock is obsessed with it. He obviously can’t do that on the road. The Leafs numbers are better away in virtually every category on the road. Can someone explain why the 4th line is getting regular ice-time in the 3rd period of games where the Leafs are down 1 or 2 goals? It’s happened each of the last 2 losses against the Bruins and Avs. I don’t understand, Leafs have Tavares, Matthews, Kadri as the 3 top centres and the 4th line is playing? On Saturday night, Matthews was on the bench while guys like Hyman were on the ice the final minute trying to score. I am completely confused how he is making lines and the usage of the forwards. Matthews barely cracks the top 50 forwards in the NHl for TOI. It’s ridiculous. Babcock himself in an interview before the season started hinted at how little use the 4th line will get with their top 3 centres. That has not happened at all. Patrick Marleau is this year’s Leo Komorov. Just far too much ice-time for what he brings. Marleau looks like he’s lost a big step since last season. Seems everyone notices except Babcock himself. He is hurting the Matthews line a lot. He’s no longer a top 6 forward. Stop line-matching at home Mike! And if your’re down a goal, bench the 4th line. Leafs top players generally play less than top players on other teams. They’ll be fine. Yikes – Time to throw the baby out with the bath water. I think the Leafs will be fine. Anderson getting hurt has really hurt them as they don’t have a solid stopper chomping at the bit behind him. I do like Sparks but he’s no Felix Potvin. Your point that the Leafs need a Dman to advance the puck and score a few goals is well heeded. I’m just worried that they are going to be fleeced on the trade.